measurement and write it down. Make all measurements to the nearest 1/8 inch. the product to be flush with the front. to mount the headrail above the casement. Height: Measure the distance from the top outside edge of the window frame the bottom outside edge of the frame. If there is not a window frame add at least 2"inches on the top and the bottom to minimize light leakage. 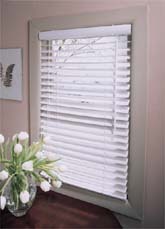 The headrail on a wood or faux wood 2" blind is about 2 1/2" high.